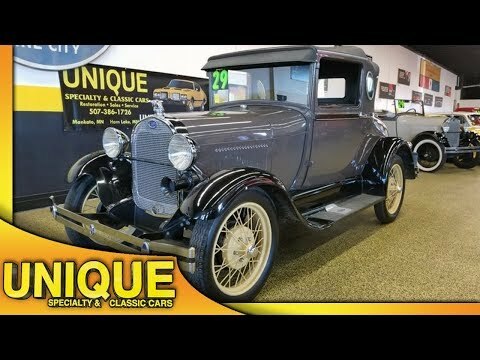 1929 Ford Model A Business Opera Coupe, rare car! TRADES? 1929 Ford Model A Business Coupe with the oval windows, also referred to as the opera coupe at times. The business coupe was a mid-year addition to Ford's Model A line in 1928. For 1929, the business coupe was given oval “porthole” windows, the type now called “opera windows,” and additional interior combinations became available. This vehicle is all steel, still powered by a straight four cylinder under the hood paired with a 3 speed manual transmission, paint is in nice shape. Nice driver quality Model A. Interior is in great shape, also has the rumble seat in the back as well. Interior cloth is in very nice shape.Starts up very nicely, very smooth running Model A as well..
Give us a call at 507-386-1726 to inquire. TRADES WILL BE CONSIDERED AND FINANCING IS AVAILABLE!